Update: more photos and information in the followup post. Wow, things have been very busy lately–I moved to a new apartment, traveled to China, attended my brother’s wedding, and still had time to finish another clock! This one actually does have filaments. There are 12 light bulbs per digit; one for each numeral, and two for decimal points (left and right). These are neat little display modules that were made by a company called IEE (Industrial Electronic Engineers) way back before 7-segment LEDs were invented. Each light bulb sits behind a clear printed slide with the corresponding number printed on it in negative (the number is clear and the background is black), and in front of the slide is an array of tiny lenses. When a light bulb turns on, it projects an image of the number through the lens and onto the back of the lightly frosted plastic at the front of the display module. The Vintage Technology Association has a great exploded view so you can get a better idea of how this works. The clock itself is fairly pedestrian although this design uses a quadrature encoder (the black knob on the upper right) to set the time. Instead of pushing on a button and waiting while the numbers slowly tick by, it’s much easier to just spin a knob. Keeping time is the function of a DS3231 IC. The display is not multiplexed. A multiplexed display would involve a lot of diodes which would dissipate quite a bit of heat, and for this design, I use 6 ULN2003 driver ICs connected to 2 MAX7300 GPIO expanders. Technically I used devices that are pin compatible with the ULN2003 since nobody seemed to have any in stock. The microprocessor is a PIC18F2420 which communicates with the DS3231 and both MAX7300 devices using I2C. Here is the back of the clock. You can clearly see the vents which allow the heat from the light bulbs to dissipate. 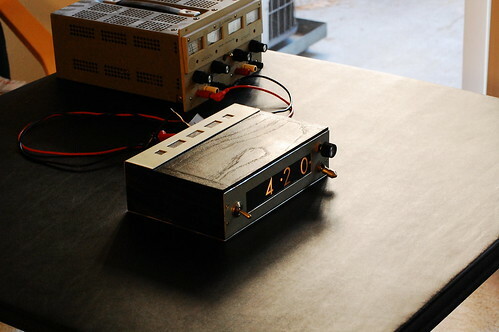 This clock will be at Maker Faire, so if you plan to attend, feel free to stop by my booth and take a look in person. 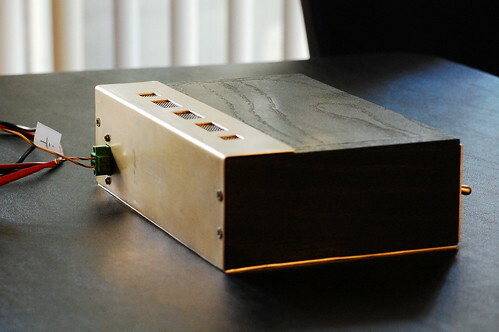 This is just a personal project, but don’t let me stop you from building your own! Can you reveal where you got the digit displays ? Or did you make them? Did you make the projection displays yourself? If so, how/where did you get/make the optics/filters for it? 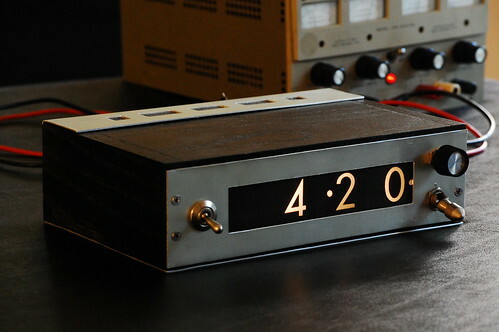 I’d love a clock like this but I can’t imagine how to could build one. The IEE display modules I found in as part of some old rackmount indicator system. Got it for $10 at the local electronics flea market. I have a few of these and a clock was one of the potential projects. I too got them from a surplus electronics source. Rather, my dad did sometime around 1980, probably from a GE auction. I can’t bear to part with them because they’re just too cool. I did pull them out just now to see if I could make a PCB to mount LEDs and emulate the “excellent heaters that give off a little light”.